I hadn’t planned to show a second one, but after Ann reminded me about this quilt I changed my mind! 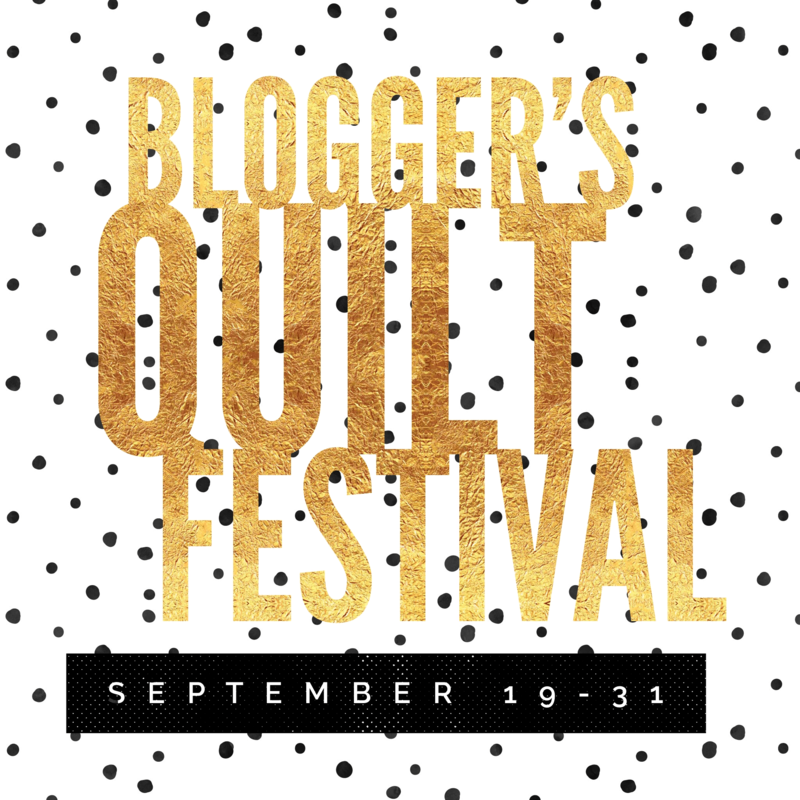 Another entry into the Blogger’s Quilt Festival for 2016, which you can check out by clicking on the link, or on the button to the left. This one is the Bookcase Quilt. Although it’s another original design, I already have one there, and this one is just small enough to fit into the Small Quilt category in the Festival. That’s how books are supposed to end, isn’t it? And that’s how the story of the Bookcase Quilt is also going to end. It’s done, despite a number of delays and obstacles in my path, and I’m very happy with it. It’s not my most immaculately made or quilted piece, but it’s perfectly personalised and tailored to its new owner. I’ve had a lot of fun making it, too. So here it is. The eagle eyed among you will observe a few pins still in the binding as I had not at that point quite finished stitching it down. I had to get some photos while there was still reasonable light, as it’s going off tomorrow to my niece. The pins do make that side hang a bit strangely, but at least I have a record. And now it’s time to move on to something else. I have my F2F blocks to make for this month, I have a large blue & white Bulldogs RFL team quilt to make for the 60th birthday of a friend’s husband, and I have a pile of fabrics and garment patterns singing a siren song, which I’ve firmly resisted so far. I’m going to start with pressing all the fabrics and cutting the pieces for the Bulldogs quilt, all 240 of them. I drove my niece to the airport this morning. With considerable regret, I might add, and not just because I wasn’t able to send off her quilt with her. She’s been a wonderful guest, entertaining, undemanding, helpful, happy to join in whatever fun was on offer, and deeply appreciative of my cooking. We had a very good time together, and I’m sorry she’s gone. I was considerably distracted from the matter in hand, the Bookcase Quilt, but as she pointed out, she’d happily wait, and I could send it after her once it was ready without killing myself to get it done before she left. The vertical seams are joined edge to edge with large zigzag stitch. The horizontal ones are held in place with masking tape just until I can get round to stitching them on Monday. Top row, waiting to be added. So instead we had fun, I didn’t sew as much as I planned, and the quilt is lying in 3 pieces, waiting for the assembly to be completed. The quilting is complete. I didn’t stitch any detail into the owl bookends; I did some test pieces and wasn’t happy enough with the effect to risk messing up on the actual owls. I’m fine with them as they are now! Assembly has started: I have joined the three blocks across the top, the middle and the bottom, and the strips that conceal those joins on the backs are done. Today and tomorrow I have baking orders, tonight is family dinner night and I have the meal to prepare for that, so the next time I’ll be able to sit down and work on it is Monday. That’s OK. If I can finish the assembly on Tuesday and take the binding with me to my sewing group to be hand finished, it’ll be done by the end of the week. I wanted a photo of us both with the quilt, but will have to content myself with any photos she sends me of it in use: in the park, at the beach, at her yoga retreat, on the sofa with yet more books…. It’s been the first time I’ve been able to get back to the sewing machine since my last post. On Sunday I was struck down by one of the worst migraines I’ve had in many years. Acute light sensitivity, disturbance to my sense of smell, a vicious headache and periodic nausea. No sewing for me that day. My niece arrived on Monday, and all thought of work was abandoned She had been in the country 3 days, and her luggage had not yet arrived. Large quantities of time and stress have been devoted to finding out what Air China have done with the suitcase containing all her most treasured possessions, carefully packed for the start of her year in Australia. It left London, and somewhere between there and here (with a stop in Beijing), it has gone walkies. Air China are profoundly unhelpful, and their customer service number ‘is no longer in service’. Her insurance company wants receipts for everything in the suitcase (I ask you, who keeps those for garments three years old, some of them? ); only Qantas are being helpful, saying they think they have found it, but she won’t know till she goes back to Sydney on Saturday. We are crossing all fingers and toes. After a trip to hospital this morning to have a cardiac monitor fitted for 24 hours, today, at last, I got back into the sewing room. I’ve cut the backing and batting for all the squares, and have pinned and quilted two of them. You can’t see it very well, in these small photos, but if you click on the image you’ll be able to see the spines puffing out between the lines of stitching in a most satisfactory way! The background has 2″ cross-hatching to stabilise it and contrast with the straight lines of the books. That’s invisible, which I’m quite happy about. I’ve also sewn on one of my TTFC tags as a spine label on one of the books, and have put a plaque on the owl block which has her blog logo on it. I still hope to get this finished before she flies out on Saturday morning. It’s going to need some seriously concentrated work on my part and a strong following wind, but she’s delighted to lie on a sun lounger in the garden with a book and a cup of tea or go for a ride on my bicycle rather than waiting to be entertained, so we’ll both be spending quality time doing what we enjoy. She’s totally un-crafty, so I can’t conscript her to help finish the quilt, but she’s excellent at making cups of tea! What sound does an owl make? WOO HOO! Much like myself! I have finished all nine blocks for the front of the quilt. And speaking of owls, the owl bookends are prominently featured – I spent some quality time fiddling with the image in PicMonkey’s editing suite, and managed to boost the greyscale and contrast enough to make them work. I find the contrast between the realism of the photo transfers and the simplification of the book spines a little odd visually, but not enough to try anything more complicated! The final block is a straightforward, simple one with no extra bits. I’ve rearranged the order of the blocks to satisfy my sense of symmetry a little more, and I’m much happier with this new arrangement. Tomorrow I will press the backing fabric and cut from it the nine 20″ squares I need, and the same again from my batting roll. If I have time, I will sandwich and pin the nine sections together. Another shelf finished, this time the one with the big capital L in honour of the one she has on her bookcase at home. The L jumps out so much that I thought I’d better keep the books quite simple and plain otherwise there’d be a visual fight going on. I found a great family photo for the quilt in my huge iPhoto file. It’s of my brother and his 4 daughters, including my visiting niece, and they all look lovely, even my brother… (in case you’re wondering, he doesn’t normally dress quite so formally, he was getting married!). I just reversed the image in the online free PicMonkey editing suite, printed it onto transfer paper, dry ironed it to some plain white fabric, and then bound it as I would a quilt, to give it a 3D frame which stands out from the quilt surface. I really like the effect! The figures in the photo I will outline quilt, so they’ll have a little dimension as well. This is fun! I still want to feature those dratted white owl bookends of hers. They’re extremely cute, but the problem is that the images of them you can find online are either at an angle or lack enough contrast to make a good transfer; you lose a lot of image quality when you bond it to the fabric. I’ll do a test edit of an image to see if I can beef up the grey-scale and contrast enough to get something usable. If you want to see what the bookends look like, go here for a nice photo. I’ll be back tomorrow with more to show. Books never stand totally straight in real life, do they? I gave myself a slightly more challenging layout for this one. Piecing in the triangles so the books lay at just the right angle was fiddly – I had to unpick one seam – but not too taxing. Which is just as well, because it’s been a busy day, catching up on mail, shopping, doing laundry, picking up a good dozen palm fronds which had come down while we were away, watering, and checking some legal stuff. I was glad to retreat up to my cool sewing room and fiddle about with strips of fabric! I’ve also made the fabric selections for the last two shelves, but these are subject to change without notice: sometimes it just looks wrong second time round. I have to download some family photos so I can see if there’s one I can print out as a transfer, put in a fabric ‘frame’ and place it on one of the shelves. My niece also has some fabulous owl bookends, but I’m not at all sure how I’d achieve those, they’re carved white stone. The final trinket I’m fairly sure of managing, since it’s a large white L, and even I can’t stuff that one up! More soon: I have a serious deadline now, she’s arriving on Monday and leaving 5 days later!